Fireworks & Rocktopia readers will be familiar with the names of Christian Liljegren (ex-Narnia) and guitarist Tommy Reinxeed, who together have worked on many projects over the last few years, including 7 Days, Divinefire and Audiovision. 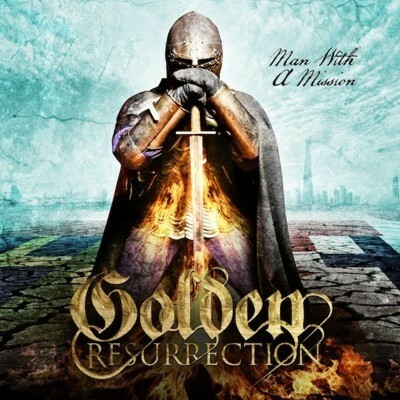 If you enjoyed any of the acts I have mentioned or their music, then you will want to get your hands on a copy of this sophomore release by Golden Resurrection as soon as possible. Why? Because the 'Man With A Mission' album is one of the best neo-classical albums I have encountered in quite some time. A word of caution for some of you though (I don't think it matters myself - but), the band are Christian through and through and I know that some people have a problem with religious lyrics, so Golden Resurrection might not be something you'll want to hear. If your not bothered, then 'Man With A Mission' will strike you as an album filled to bursting point, with blazing guitars, killer vocals, thunderous drums and a pleasing amount of dramatic keyboards, all joined with a fantastic set of high energy rock songs. I'll pick out just a handful of these songs to tell you about and let you discover the rest for yourself if I may? 'Identity In Christ' has a storming guitar riff with some intricate lead guitar work thrown into the mix, joining this with the powerful vocals of Liljegren only helps to make this song a force to be reckoned with. 'Standing On The Rock' is pure Stryper with another catchy as hell (can I use that word during a Christian album review?) guitar riff, that Oz Fox and Michael Sweet would be proud of. Once again the vocal of Liljegren soars while the pounding bass and drums of Steven. K and Rickard Gustafsson give the track a driving intensity that is mesmerizing. 'Flaming Youth' is the kind of song Malmsteen used to be able to write circa his 'Trilogy' period: guitars, keyboards and vocals weave an aural tapestry that engulfs the aural senses as you listen. And finally 'Golden Times' which reminded me of that awesome band Nation. The track itself is another guitar-driven rocker but one that also keeps in mind the need for melody and hooks. As a bonus the band end the album with two cover songs namely 'Point Of No Return' by Kansas and the late, great Gary Moore's 'The End Of The World'. Now I'm not a big fan of cover songs but Golden Resurrection do a fantastic job on both songs and it's a fabulous way to end a great album.